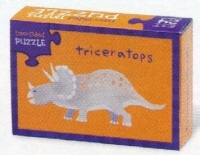 A 24 piece, two-sided puzzle made of extra thick cardboard with a different animal on each side plus a fun fact sheet. Puzzle measures 5" x 7" contained in a small box (3.5" x 2.5"). Makes a nice stocking stuffers or party favor, even for adults.